Quilted down jacket by BOGNER. Wonderfully warm jacket that showcases BOGNER’s typical look. 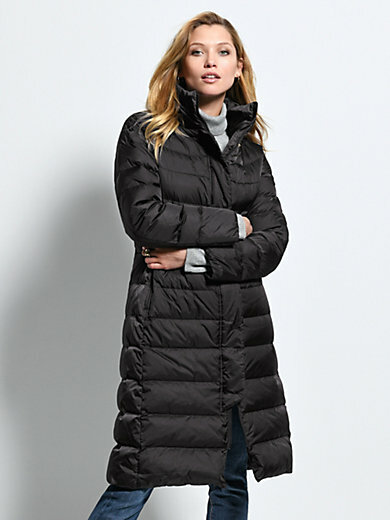 Made of soft, horizontally quilted microfibre with slimming vertical quilting at the back and a lightweight feather filling in 80% down, 20% feathers. Warmly padded adjustable collar, concealed 2-way zip fastener with “B” zipper, press stud panel and 2 zipped seam pockets. Logo on the sleeves and elasticated cuffs. Outer fabric and lining in 100% nylon. Length approx. 41ins. The quilted jacket is machine washable.